Earlier this year I was fortunate enough to be invited to be part of an expedition team led by Dr AJT Johnsingh. The trek was from Mukurthi National Park in Tamil Nadu to Silent Valley National Park in Kerala and the primary purpose was to evaluate the importance of the two national parks in the conservation planning for large mammals. A delightful and detailed account of the expedition has been written by Dr AJT Johnsingh in the Frontline magazine. While I had no scientific expertise to add to the mission, I did have ulterior motives. This route goes via the famous Sispara pass. Sispara was used by the British as the shortest ditance between Ooty and Kozhikode. Around the 1830s a British officer of the Bombay Army named Stephen Ponsonby Peacocke was in India with his regiment and was in Ooty up in the Nilgiri Hills convalescing from an illness for some time during this period. He had a lot of free time on his hands and since he was good at painting, he created 17 drawings of spectacular landscape views in the Nilgiri Hills. His artwork is known for being lifelike and to proportion and scale. He finally published all of them in 1847. Thanks to wikipedia, you can browse through all of them. Before the trip, I printed out all these photographs and carried them with me to search for these landmarks which were painted more than 170 years ago. From the start of the walk, I was looking at every mountain, every peak, and every pass, and was trying to compare them with the photographs that I had with me. I found this one by accident. It was just 10 m away from the main walking path, but was not at all visible from the path itself. For some funny reason I decided to check it out and there it was, the Devil’s gap. The minute I saw it, I knew this was the one. Not much has changed here in the last 170 years it seems. The rocks were still the same, the hills in the background were the same too. And the forests that can be seen through this gap is the Nilambur Reserved Forests, renowned for their teak timber. This is a very well described place, so I more or less expected to find this place. Infact if you look at this location in google maps, you will know why it was so easy to find. I photographed this from a ridge, but looks like Peacocke painted this landscape from a place much lower than where I was, since the perspective is different. But if you observe the peaks, they are more or less the same. This was another location which I found by accident. We had reached the Sispara Pass trekking shed, and after a brief period of rest, were about to start climbing down into Silent Vallery National Park. The peak itself was covered in clouds, but suddenly it opened up and I realised that this was the main peak that I was looking for. I took some quick photographs before the peak disappeared behind the clouds again. When this place got declared as a National Park, all the people were moved out. So now this place is a good patch of forest. You can still see some remains of old houses in the new photograph and the possible stream (now with a check dam across it) that was flowing with water back then. The forest guard also told us that there were some more remains of the old shed inside the forests which we didn’t have enough time to explore. Overall I was more than happy to find 3 out of the the 17 landscapes. Mr Narayan Swamy owns some of the original lithographs and he has been very kind enough to scan them and put them up on Wikipedia. Would anyone else who knows Nilgiri hill ranges well be interested in trying to find the other locations and photograph them ? I think it will be a great project to record landscape level changes over centuries. Very interesting! I can imagine the exhilarating feeling on discovering those landscapes. Great work Kalyan. The resemblance of Devils gap is uncanny. Btw, i’ve uploaded record shots of a leopard sighted in Bandipur on my blog. I saw your post on your blog. Really nice stuff. Thats one thing you get to see when you spend time in the forests.. its not just quick glimpses of wildlife, but amazing events like that. Thoroughly enjoyed, its amazing how paintings and photography together can bring about a feel of the place from past to present. You have traveled to Nilgiris quite a bit. Have you come across any you think ? 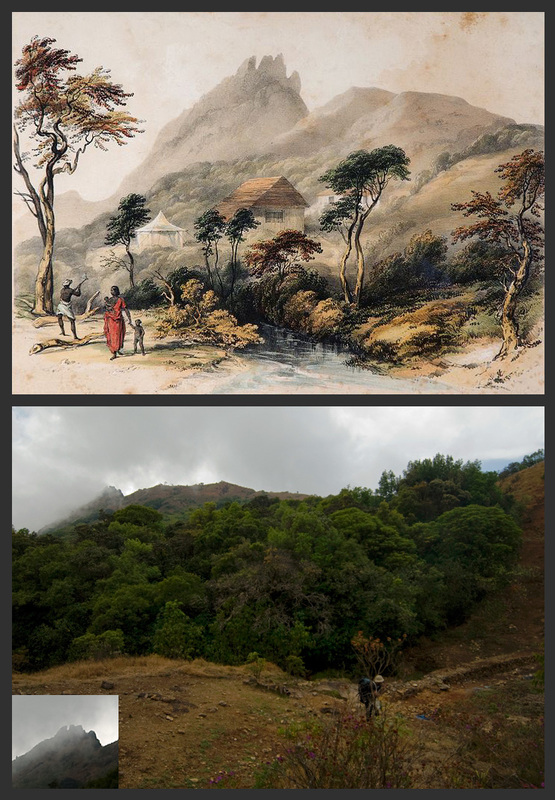 Hey, this is great stuff, I grew up in the Nilgiris and hadn’t heard of these paintings. The next time I am in India, I am hiking in the Nilgiris for sure, would be fun to complete the series. Awesome! I do hope you publish this in the print media – it is so interesting! WoW! 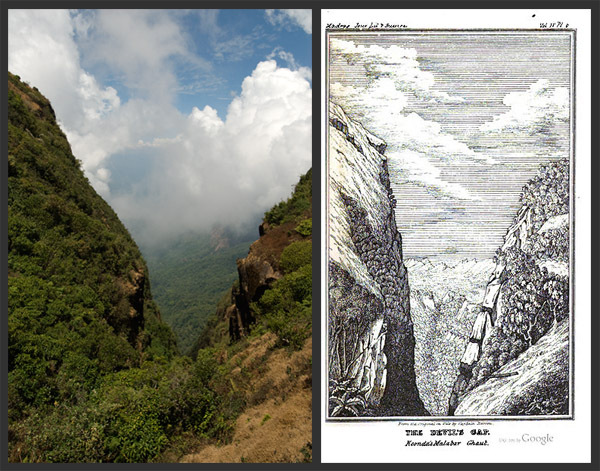 the resemblance is indeed uncanny.. Devil’s Gap especially.. must have been an awesome feeling to be able to connect to something 170 years old and the present.. Very interesting! Would be great to find the other locations too! see your great photos and commentaery showing correlation with Peacockes lithographs. When I was approaching Sispara shed the clouds parted for just a few seconds and I too was able to see Sispara peak for only a few seconds but unable to get a photo. Anything you may add to these articles including photos would be most appreciated by the wide community of those who love the Nilgiri Hills. I have been fascinated to read your entries about Sispara, Silent Valley, etc. Do you have a map reference for the Sholakul forest bungalow at the bottom of the pass? I walked down what we used to call Smuggler’s Path in 1957 with three other boys and Mrs Willy, the Headmaster’s wife from Breeks memorial School, Ooty. We sheltered for two nights in the ruins of that bungalow, protected by the elephant ditch around it. I would love to be able to identify the spot on Google Earth. Down at the bottom of the Sispara ghat, near a river, in a clearing, was a forest bungalow, surrounded by an elephant ditch. It was already fairly dilapidated when we were there in 1957, and this was shown clearly when it rained and there was hardly a dry spot in the house! One thing it still had was all the crockery from pre-1947. You really have a fantastic eye! I realize after seeing your pictures that most of the places in the snaps can go unnoticed easily.. esp the Devils gap. You need to have a sharp eye for details. When I went in May, I had tried to spot these places too. I have a faint idea of 2 pics. I think I shared it with you already. Here is a pic of one of them.. though not as cleanly shown as yours. I went to “Manjakkal mund” behind Botanical Garden… but I dont think that could have been the place. The other popular Toda mund in Ooty is the one near collectors residence / Tamizhagam. I think this too is not the one! I will try to make one more trip in October… maybe I will get to see the places!! But thanks for the post.. I enjoyed it and it has brought me a new perspective towards the Hills of Nilgiris!! Nice stuff Prem. Where in Ooty did you photograph it from ? Do you have coordinates ? It would be nice to collect all this in one location. Also what is the other photograph that you have found ? 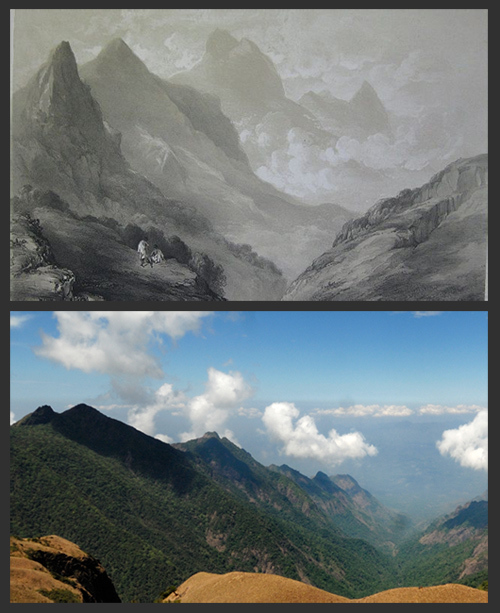 I might do a quick trip to Coonoor next week, so will try to see if I can find any of these landscapes. Here are my notes of a few snaps. 1. The pic above was shot from Marys Hill in Ooty. I was leaving Ooty and while driving I suddenly realized that this could be one possible spot. I took a pic. But I guess Peacocke painted the place from Jail hill (or the current location of Taluk office / Ooty govt hospital). This locn is very easy to find. From the railway station, go up towards Govt hospital. 5 mins by car. 2. Waterfall_From_Bungalow_at_Colhutty,_Segoor_pass image, I guess u know this one already. This is the same Kalhatty falls which is still there, but water levels are not that impressive. 3. The govt house picture could be Raj Bhavan behind Botanical gdn. The old one I mean before the current one was built in 1870s.. but I was not able to confirm it as the place is too wooded to get a clean view of the hills. Also, not sure if the old Govt house stood at the same place as todays Raj bhavan. 4. The Toda hut in “Toda Mund and Todas, Ootacamund” picture could have been Manjakkal mund.. right at the back of BOtanical garden.. but I am not really sure. Maybe you can have a look at the picture I clicked. Since Peacocke’s painting says it is Ooty and shows a bungalow in the background, I thought it had to be this one. I will dig through some of my Ooty pics and will update you on this soon. I kept this pending and soon forgot abt it until you came up with this post. Hey Dude ! What ve you been upto ?? This is sooo Amaazing ! I too have wandered Nilgiris for long.. will try to gather some info. Koondah pass is soo dam unbelievable ! I second someone. You really ve got an EYE ! Beautiful…So nice to see that things haven’t changed much in all this while. Pretty awesome how closely your photographs match the drawings. Also looks like British Library seems to have a lot more historic landscapes. Do you have access to all of them ? I will give you a ring when I am ooty next. Can you leave me your phone no ? Also the ooty-coonoor landscapes seem to be amazing too.. it would be worth trying those landscapes as well. I have resorts in KOLLI HILLS, 275kms from Bnagalore. Kolli Hills is not known to much as a hill station and it is a nature photographers dream to find new spots, then Kolli Hills will fit in. I know some places in KOlli Hills, which are awesome. If you can capture the nature what I see, I”ll be happy. If you agree to come to kolli Hills, I”ll host you Please. Anyway, I stay in Bangalore. Call me to discuss further. You can visit http://www.tamilnadutourism.org website also to know more about Kolli Hills. Wow…!! Super kewl Kalyan.. 🙂 how many more were you able to identify of the 17 drawings ? I am sure this is something that gives that sense of satisfaction. I have been to mudimalai quite often but never did this sort of a research. I wish I could be on one such visit if not with you at least with some tips from you on how to make it. 7. One more near Tamizhagam.. its called Thoduvar mund (toda mund). not sure of the toda name itself though. Thanks for the compilation Prem. I am sure most of these Toda hamlets have gone through a lot of transformation since 100 years. Noticed that you are planning a trip in Oct.. great stuff. We should start putting all these together as much as possible. Hmm. True Kalyan, the Toda munds have changed so much. Their houses are no more made of thatched grass, bamboo reeds and rattan cane.. instead have concrete structures with support from the govt. Last heard that their no is less than 1200. Many of them have left Ooty, converted to other religions, etc. Todas are slowly fading away! Yeah, we should put all these findings at one place. I think Wikipedia is the best place. Maybe on the existing pages itself.. ? I remember you showing me this a few months back and it immediately grabbed my attention because this is one of my favorite subjects, studying landscapes and how they have changed over the years. I did something similar with Krithi Karanth over many loops including Mudumalai, Bandipur, Sathyamangala and BRT for her project and it was a lot of fun. I’ll be doing something similar in Bhadra few weeks from now. I plan to do small projects on my own and Ooty has captured my attention. I was there for a brief period last week but couldn’t do much, so I have it on my mind and may do a trip again sometime soon and will keep you posted. This is very interesting Kalyan! Hey Kalyan! This is superb concept and great work. The painting and photographs side by side provides great insights. Impeccable comparison. Love it. There must be many such gems on Indian landscape sketches painted long past and that are yet to be rediscovered…!!!! fantastic. the photographs makes me to start for the hill stations. My long time resident in the Nilgiris friends too, are very taken with these images. You have a awesome blog going on. Its been a long time since I left India. Frequented Borivali National Park a lot. Good stuff outta here amigo.. One quick question. What kind of gallery software that you have on the website..
You have posted a broken link for Dr AJT’s post in Frontline. The correct link is here – http://www.frontline.in/fl2616/stories/20090814261606400.htm. Btw, excellent images. Great going. Thanks for the updated link. I have changed it. These are excellant as most people here do not know about Sispara, chinese prisioners and well the English were not the first to climb the Sispara and leads to Mannarkad passsing through the Silent Valley. The lower reaches of the Sisparra are quite dangerous. incredible work!! !now let me look at stephens pics,im quite familiar with the upper plateau areas…. Came across your website through a friend’s suggestion. Very Impressive Kalyan. amazing!! just amazing. BTW Kalyan Nandi hills is another great place for avian photography. really great pics and yeah one has to give the credit to the man who drew those sketches over a century ago. The accuracy is excellent. over 100 years and I am totally into the outdoors. and I’d love to do some outdoor work with you. did you observe the stones olfuthit and irfuthit where the today spirits pass through and in doing so leave this world for the next? Is the journey from Upper Bhavani doable by a 55 year old? I been born and brought up from this blue hills, when ever i came across the devils gap picture and was imaging how it will look in reality now and you made that come true, thanks for making so wonderful and thanks a lot .